You’re a Government-installed landlord in a totalitarian State. Your job is to spy on tenants, peep into their lives, eavesdrop on their conversations and profile everyone to ensure laws are beyond obeyed and the State is kept happy. Anyone caught plotting against the State’s ever-changing laws MUST be reported. But will you? Set in a dystopian world where privacy is dead and the State controls every aspect of life, it’s your choice to continue being what the State requires, or be the empathetic landlord who turns a blind eye. All your choices will have consequences , and the consequences will be yours to deal with. Beholder Complete Edition also contains the Blissful Sleep DLC, a new scenario based on an ex-landlord, with all new tenants and stories to discover. 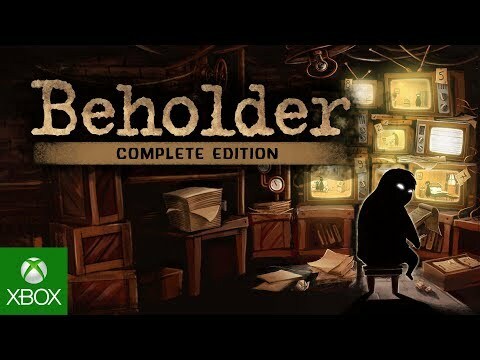 Beholder Complete Edition was released on Switch 135d ago in the US and the UK.